Vacancies recruitment. Last date to submission of application form to HP DTE is 09-4-2019 (For Hill Area candidates last date is 24-04-2019). These vacancies are for the Vocational & Industrial Training Colleges. Candidates will be shortlisted based on qualifying exam marks and reservations. 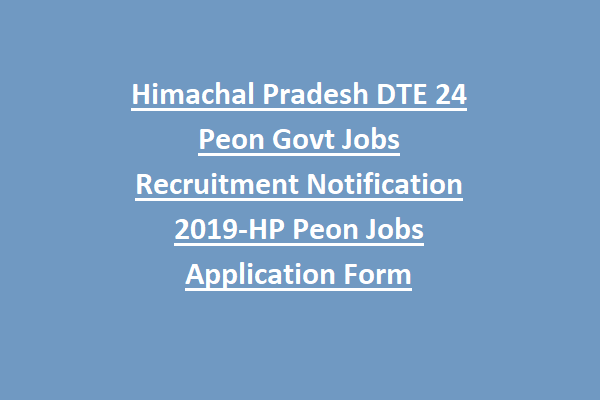 Detailed information about this HP DTE Recruitment 2019 - 20 Lab Attendant, Peon and Store Attendant vacancies is mentioned below. There are total 24 posts in this HP Directorate of Technical Education. For Store Attendant, Lab Attendant Posts-Middle Class passed candidates are eligible to apply. For Peon posts Matriculation qualified candidates are eligible to apply. Candidates selection will be based on qualifying exam marks, reservation and certification verification. It is mandatory to show the original document at the time of documents verification. For all the posts monthly salary is - Rs. 7500/- Per Month. For General Application Fee is - 200/- & For (OBC/ST/SC) Candidates Application Fee is - 100/- & No fee for (PH/Ex-S). 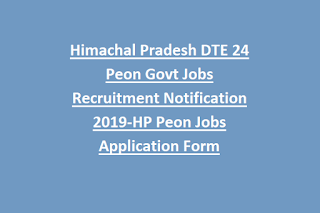 Candidates who are interested in this HP DTE vacancies they download application form from official website of http://himachal.nic.in. Submit the filled application form to HP DTE on or before the last date of 09-04-2019 (For hill area candidates 24-04-2019). Address -Director of Technical Education, Vocational and Industrial Training, HP, Sundernagar, District Mandi - 175018. For Long Distances or Hill Area candidates last date is 24-04-2019.